This is another set of cards I made for Christmas using distress inks and perfect pearls mist to create the sky background. I lost my texture paste and would have loved to put some white stars on the card, but never mind, I was happy with the result! I'm adding this card to Merry Monday#181- Blue and White with texture. Thanks for dropping by! So pretty! Like the extra glitter strip at the bottom! 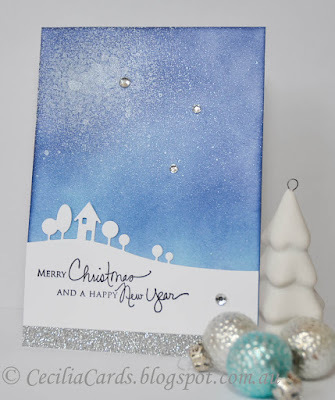 Such a pretty background and the sequins and glimmer strip at the bottom really add glitz to your card! 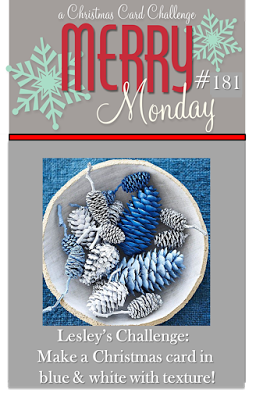 Thanks for playing Merry Monday with us this week! Fabulous card, I love your beautiful winter scene. Thank you for playing along with Merry Monday. Beautiful card Cecilia, your shimmery background is lovely. Fabulous photo staging as well. Hi Cecelia, Just love your card, it is beautiful,!!!! Beautiful, I love your gorgeous sky! Very pretty card! I love the sky and the glitter strip at the bottom. Thank you for joining us at Merry Monday! Beautiful sponging, Cecilia, on your oh so pretty card! So pretty! I love how the perfect pearls mist looks on your card! Beautiful, Cecilia! I love the sky and the rhinestones make beautiful stars! Thanks for sharing this with us at Merry Monday! Love the die and the sponged background. Great card. Perfectly CAS. Love the sponged sky and the diecut is just super against it. Great touch of sparkle too!